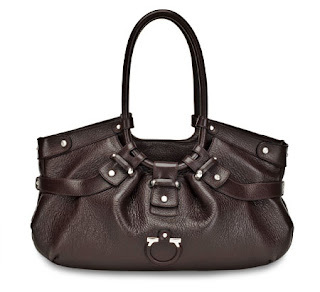 I have been eyeing this handbag for a few months now. I told myself that it will be in my wish list for this coming December's sales. Then today, one of my Sifus, The Iron Lady, is in town and wanted to catch up. We took a stroll to her favourite place, New Bond St, as she wanted to get a red handbag (she gave hers to her daughter). Knowing her, if she finds something she likes, she'll buy them (with or without discounts). Perhaps it was our lucky day. While browsing in our favourite store, the sales assistant said the magic word. Yup. Some of the items were on sale for the day. Looks like I have to ditch the boogie bag from the wish list (or probably I can postpone it to Easter. That way, I wont feel guilty. Or pray harder for a decent bonus). *rolling eyes* But I just bought a handbag 4 months ago. Sigh. A woman simply couldnt resist the magic word. By the way, it was really a good bargain. The lil one responded differently tho, "I know this shop. You always get their handbags. But why didnt you bring me to go shopping? I thought I was your fashion consultant." Gulp! It is not helping at all knowing my girl has fine taste. I'd end up shopping more! yeay a shopping entry! and a nice handbag too!though i like to believe that i shop more sensibly these days compared to few years back, i can't help it--my heart skips a beat everytime i see the magic word too. ms b, write more about shopping in london please, from splurge to steal ;). i've always realized i don't have a proper black bag, but my eyes will always tend to choose something 'different' than the usual black, everytime! hohoho.. she's a smart one there, that lil one! never mind, mommy has more bags to buy girl!! I have lots of bags too - esp under the eyes! Late night blogging lah tu! It wasnt sales season and there was no sign that the shop was having theirs. You should see the look on our face when the she mentioned the magic word! Thank u! My secretary said it's very classy and reflects a 'Londoner'. She has an Anya, go figure. I want a brown bag like the Celine boogie bag but none of them were on sale. Hey, ur trip to Iceland is next week? I hope u find time to shop, esp with the drop in forex. *lol* I know. I was surprised by her remarks too. First, she knows the brand. 2nd, what items I normally get from them. and she approves the bag. thank god! I know what u've been up to. *winks* How is our Pak Malim, kucing ray yg alim, doing? It must be the most popular posting for the week! nice & yummy!!! hehehe... Mini B's designer vocabs will definitely increase! *grins* I know! My secretary & an MD said the same thing too. hmm, her vocabs are getting better each day. Luckily they are just vocabs. She doesnt mind anything as long as they are pretty.